Babblings of a Mommy: BB Creams VS. CC Creams. Which One Is Better For You? 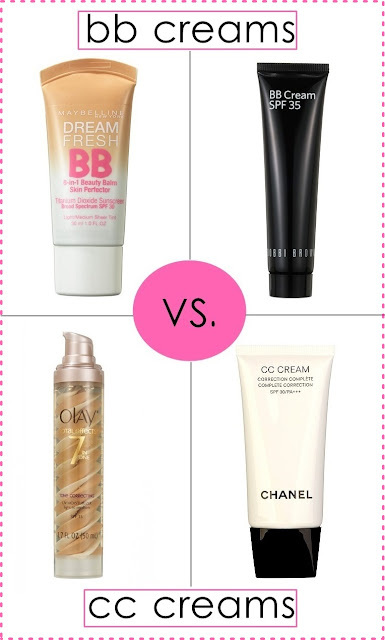 BB Creams VS. CC Creams. Which One Is Better For You? I'm pretty sure you've heard by now the wonders of the BB cream. I've been raving about them for quite some time now, but just when you think you've got everything covered - the beauty gods come up with another genius product. The CC cream! But with all these lettered beauty creams, how do you know which one is right for you? Easy! I break it down for you. Essentially an all-in-one product. Acts as a moisturizer, sunscreen, serum treatment, and hides uneven skin-tones to minimize the need for foundation. (Or you can even use it as a primer to prep your face for foundation). Basically if you fairly normal skin and like lightweight products, this is for you. Offers much more coverage and corrects your complexion. Especially made for dark spots, acne, or generally dull skin. It will help to even out your skin tone and brighten it along the way. If you need something to act like foundation, this is your best bet.